April has been a busy month – only at home for a week out of the month and not all at the same time. There was plenty to celebrate with spring in full swing and the travel to see it in different places. Certified Zentangle® Trainer (CZT) class. There were so many perspectives of the CZT class to celebrate: the beauty of the creations everyone was making, the conversations, the food…the challenge of being a student…the Zen. Train ride home. 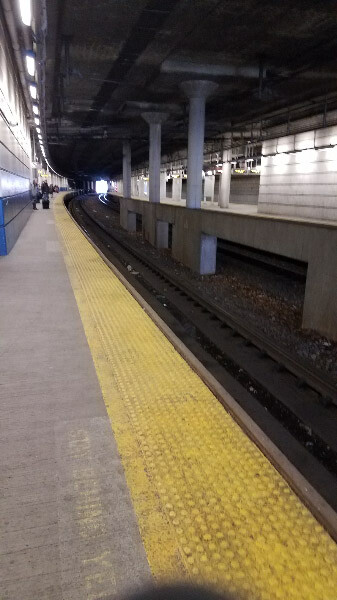 I don’t go many places where taking the train is feasible…but the CZT class was one of them. I celebrated the low stress hours going home…a fitting finale to the class. 4th and 5th grade field trips. The early April field trips happened with great weather and the students enjoying being outdoors to learn about the Patapsco heritage (land, water, and rocks) and BioBlitz. It’s always inspiring to see their curiosity and enthusiasm --- celebrating a spring field trip. Getting to Dallas. I had to travel to Dallas quickly and it was easier than a thought it would be. And I celebrated that I was less stressed by the rapid change in plans (maybe the Zentangle class providing an added benefit. Spring days. Noticing the rapidly developing blossoms of spring is fodder for many celebrations – oxalis is probably one of my favorites right now. It blooms when the sun is shining! Rainy day (spent indoors). After busy days – having a rainy day spent indoors is something to celebrate…with homemade soup for lunch! Josey Ranch Pocket Prairie. A little bit of prairie – carefully tended by volunteers – in a Dallas suburb! Right now it is a celebration of spring wildflowers. Cedar waxwings. Birds are migrating and there are serendipity sightings of birds that don’t stay around the area long. I celebrated seeing a small flock of cedar waxwings last week. Botanical reminders of my grandmother. Many flowers in my parents’ Carrollton yard were planted by my grandmother…good memories to celebrate. Home again. Providence, Rhode Island to home to Carrollton, Texas to home to Chincoteague National Wildlife Refuge and Smith Island to home. I like to travel…but coming home is celebratory too. The Howard County Conservancy spring field trips at Belmont and Mt. Pleasant are into prime time. The two I volunteered for last week had beautiful weather for hiking – almost perfect temperature and dry. I always arrive more than 30 minutes before the students. It’s a short walk from parking to the Carriage House….long enough to get some pictures. 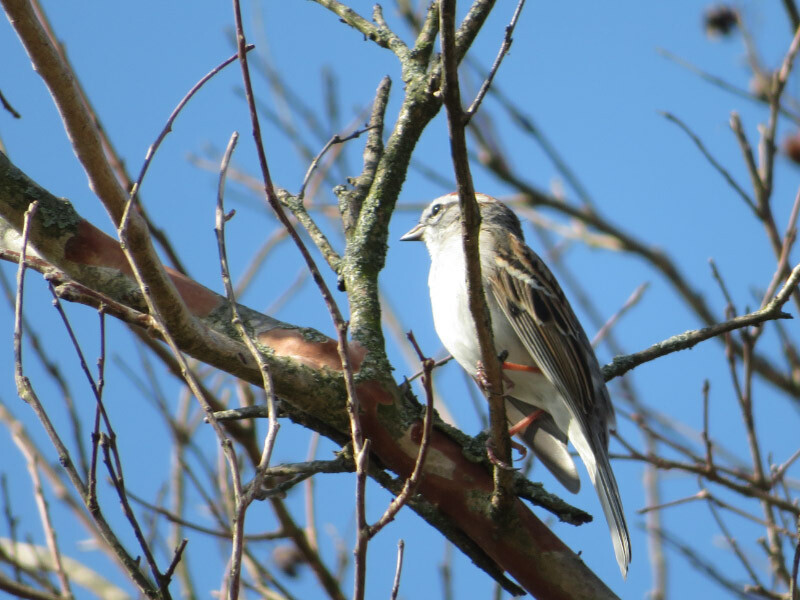 Birds that are around: chipping sparrows, robins, and red winging blackbirds. There is at least one resident mockingbird which I heard but didn’t get a picture. 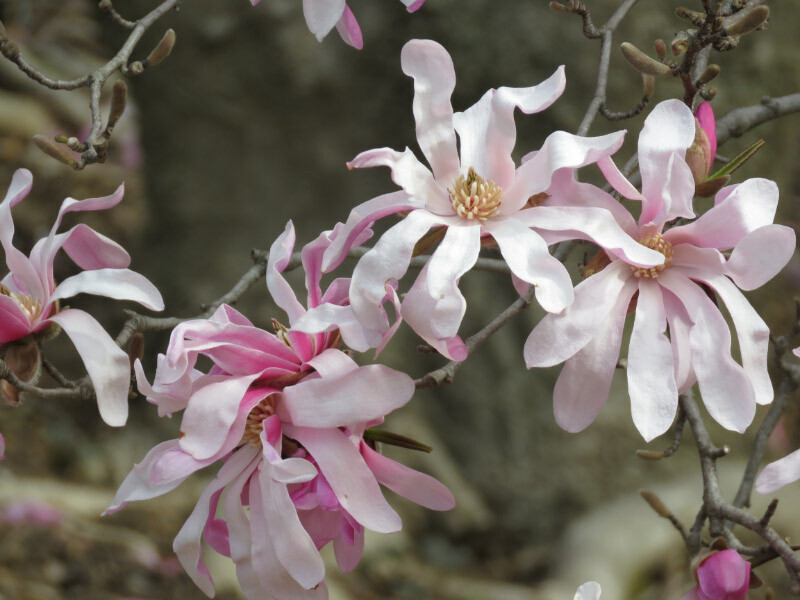 The warmer weather is also causing things to bloom and new spring green leaves to unfurl. As I wait for the bus, I take pictures toward the manor house, down the entrance road, and down toward the pond. It’s the calm….before the students arrive. The students, teachers, and chaperones come on buses and there is a flurry of activity to get the groups sorted into hiking groups and activity groups. The hikes are about an hour. There are forest and meadows…lot of opportunity for good observations. One of my hiking groups was making BioBlitz observations…documenting a common blue violet blooming in the middle of the mowed path! Coconut Spice Cake Recipe | Magnolia Days – The cake I made for my husband’s birthday. It tasted great even without icing! Photographer Captures Stunning Images of Ice Shards Along Lake Michigan | Smart News | Smithsonian – Spectacular ice forms – made during the breaking up on Lake Michigan a few weeks ago. Ancient Caribbean children helped with grocery shopping in AD 400 -- ScienceDaily – Snail and clam shells (small ones) might be from child, rather than adult, foragers! Thousands of Invasive Cane Toads Overtake Florida Community | Smart News | Smithsonian – Ugh! Not something people want in their yards and pools and driveways. These toads have a toxin strong enough to kill cats and dogs that munch on toads and can cause burning eyes or skin irritation in humans. Top 25 Wild Bird Photographs of the Week: March – National Geographic Society – Beautiful birds….changing environments and habitats. Where Have All the House Sparrows Gone? – Cool Green Science – House sparrow numbers have been declining since 1966 – all around the world! 66-million-year-old deathbed linked to dinosaur-killing meteor -- ScienceDaily – Fossils of animals killed and buried within an hour of the meteor impact! Pairing Geothermal Plus Rooftop Solar For A Truly Renewable Home | CleanTechnica – At what point will the idea of geothermal heating and cooling catch up with rooftop solar for our homes? Will Dandelion – or comparable companies - become nationwide? Five new frog species from Madagascar -- ScienceDaily – Some tiny new frogs. The smallest is only a little larger than a grain of rice. These pictures of seed bank samples turn biology into art – The beauty of seeds. The first photograph (of Australian windflower flower heads is my favorite. The x-ray of a red yucca seed head is also interesting….showing the 3D of the pod in the image. BBC - Future - What happens when we run out of food? – Even in the US, nearly 12% of households re classed as being food insecure; more than 6.5 million children go without adequate food. And the whole food system can be disrupted very easily by war and very bad government all around the world. Refugee women have healthier pregnancies than US women -- why? An unhealthy US culture: For African refugee women, acculturation may negatively impact health -- ScienceDaily – I was surprised that the researchers did not explore the idea that maybe the value of early pre-natal care is overrated for people that are generally healthy when they get pregnant since the refugee women tended to not start pre-natal care until their 2nd trimester. Top 25 Wild Bird Photographs of the Week: Migration – National Geographic Society - Birds are migrating through our area…we’re seeing more robins…and the juncos will leave soon to go further north. These pictures feature birds from around the world…that are migrating. Hospital disinfectants should be regulated like antibiotics new study suggests – It’s not just antibiotics that drive antimicrobial resistance…it’s disinfectants (particularly in hospitals) too. BBC - Future - The unexpected magic of mushrooms – New items made from fungus...replacing some kinds of plastics. It’s good that fungi are so plentiful on the planet – exceeding the biomass of all animals. Beautiful cherry blossoms photos – Our cherry tree is in bloom right now. I guess cherry trees are enjoyed around the world very year about this time. There is a picture of the cherry trees around the tidal basin in Washington DC included in the pictures. Green tea cuts obesity, health risks in mice: Follow-up study in people underway -- ScienceDaily – More research needed…. but I am enjoying green tea already (my favorite is a blend with mint). Make A Home for Wildlife – Cool Green Science – Some ideas for creating an oasis for wildlife --- it doesn’t take much to help pollinators or birds! Why did Flamingos flock to Mumbai in record numbers this winter? – 120,000 flamingoes…that’s a lot of birds! I attended the Patuxent River Conference last week. The conference was informative – lots of up-to-date information about the river. One of the branches of the river (the Middle Patuxent) is through the forest – downhill – from my house. The conference venue was the Patuxent Research Refuge and there was opportunity to look around the visitor center and onto a nearby trail. It has been awhile since I had visited the place and the visitor center was in better condition that I remembered. The displays in the visitor center had been updated. The one I found most poignant was the whopping crane display. 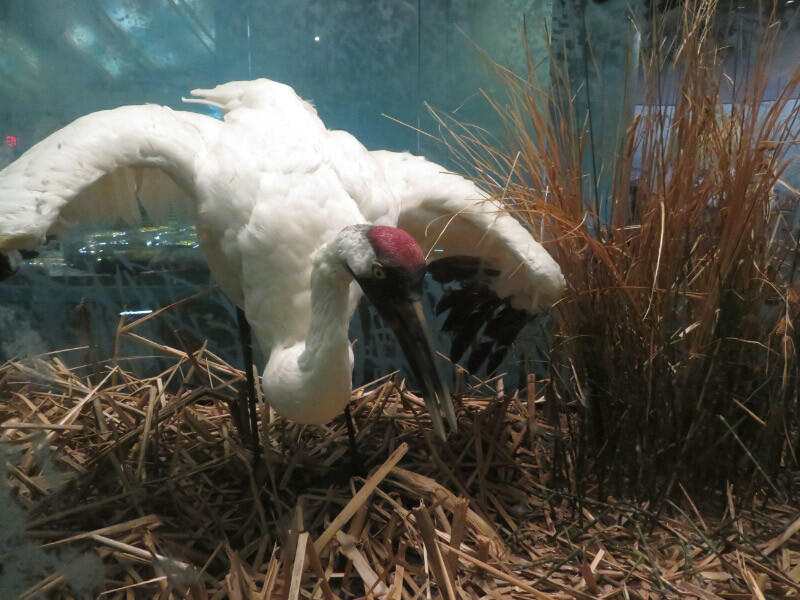 The Patuxent Research Refuge tried for years to raise whooping cranes to establish a new migratory flock but this year the effort was stopped. The whopping crane we saw down in Florida during the Space Coast Birding and Wildlife Festival (see my post here) began its life at this refuge. During the morning break – a mockingbird sat in a nearby tree. It had quite a repertoire of songs. 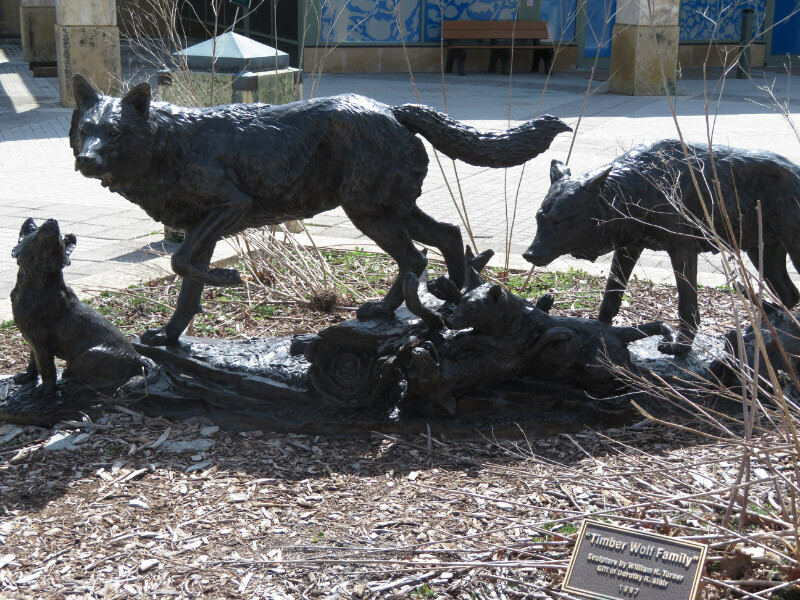 I remember the timber wolf sculpture in front of the visitor center but the colorful screening on the front windows of the visitor center was new to me. The refuge biologist let a hike during the last session of the day. A prescribed burn had been done on some of the areas around the visitor center to clear out biomass…keep the area grassland habitat rather than forest. We hiked over the causeway and into the forest. The Refuge is doing an inventory of the forest trees and taking core samples to determine the age. One of the corers got stuck in an oak and they are still trying to get it out! 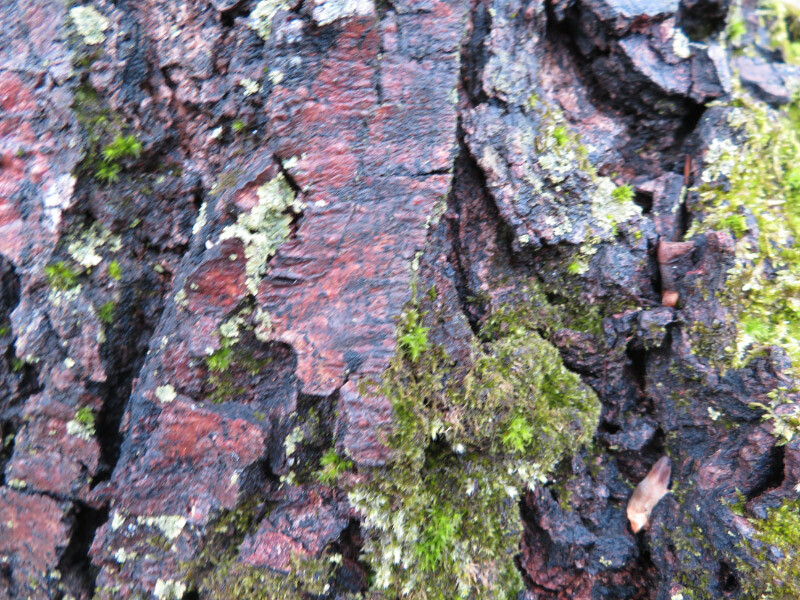 The trees are not leafed out…but some are easy to identify. Beech trees are easy any time of year. A lot of the pines at the refuge were planted about the same time and are dying off together too. There are quite a few that have fallen over. But there are still a lot of trees that fill in the canopy. This will be a very shady area when the trees leaf out. It was a good day for a conference and a visit to the refuge! 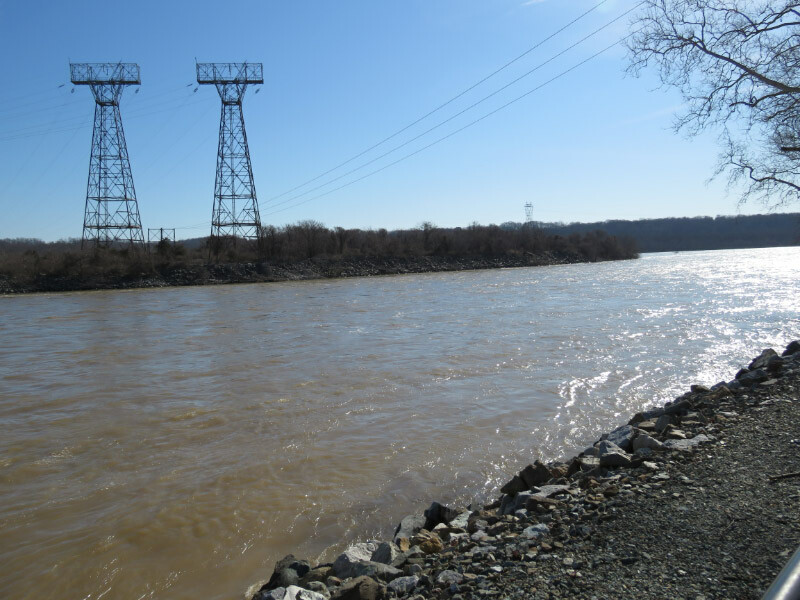 My husband and I made the trek up to Conowingo Dam last weekend. The water was high and laden with silt (although not quite as high as the last time we were there). 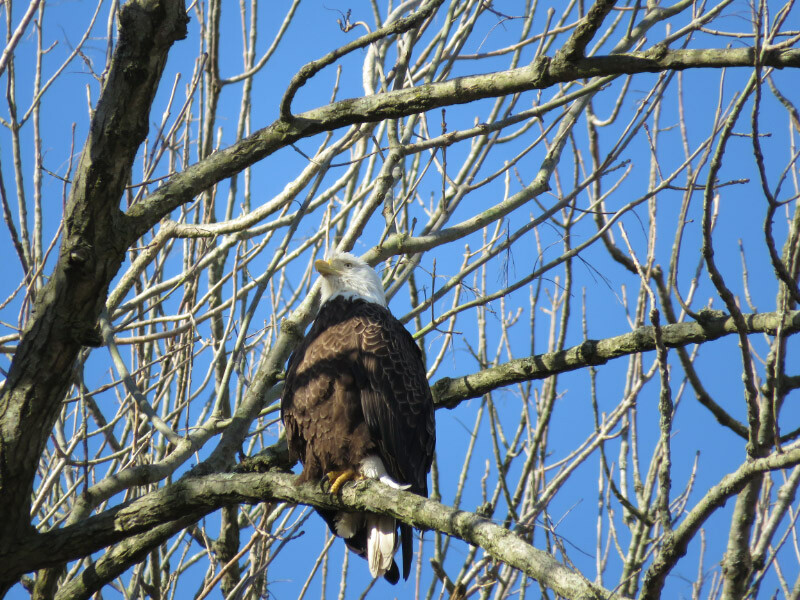 The trip was a success as soon as we got there: a bald eagle was preening in a tree next to the parking lot. I took some traditional portraits. Then I zoomed in on the talons. 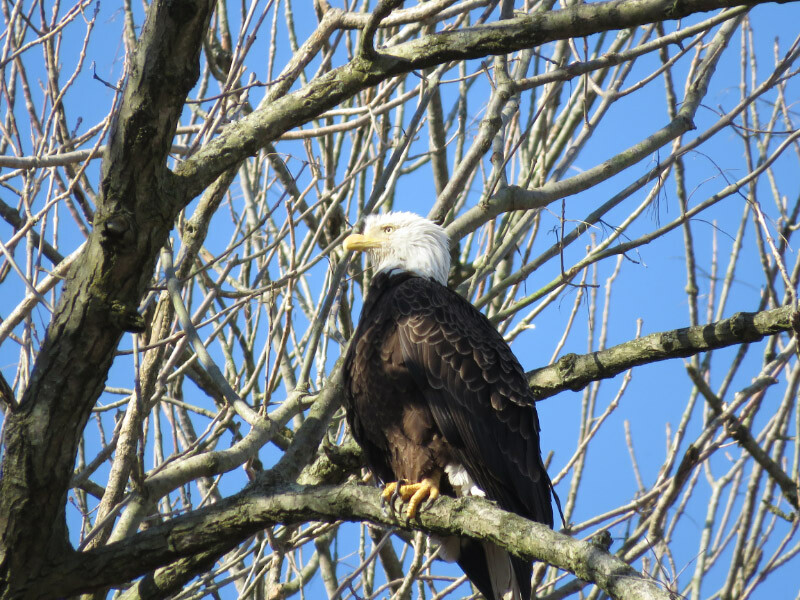 At one point the eagle did a little dance on the branch (watch the feet)! One of the other photographers told me about the nest up in the right tower across the river from the wharf where we were. 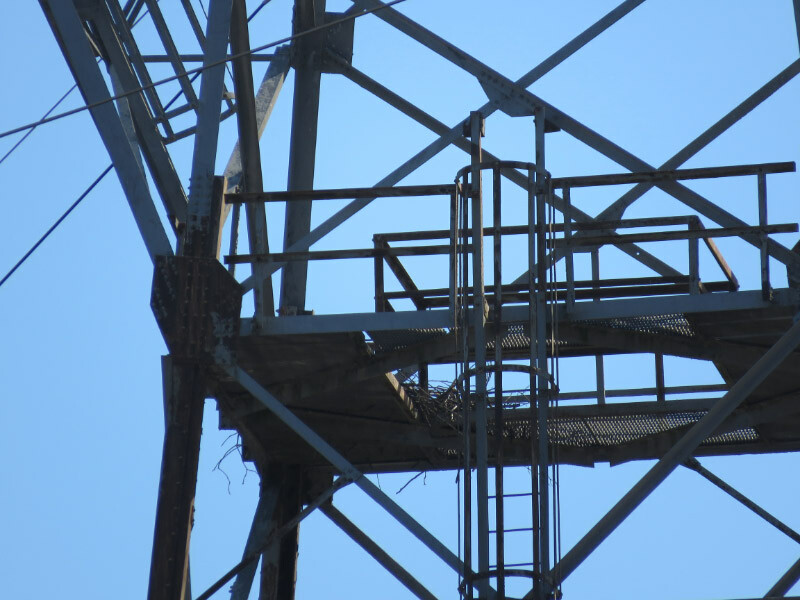 It is on the narrow platform below the top of the tower. I zoomed in and saw sticks that are probably one side of the nest but no birds coming or going. There were cormorants fishing in the rapidly moving water although I didn’t see any successful catches. I did manage a sequence of a cormorant flying low over the water. Overall it was a good spring outing – warm enough that we didn’t need out coats! Spring Outlook: Historic, widespread flooding to continue through May | National Oceanic and Atmospheric Administration – Check out the map about 1/3 of the way through the article. It looks like quite a few areas along the Missouri and Mississippi Rivers are going to have moderate or major flooding through May. Almost the whole eastern part of the US is going to have some flooding during that period. How Chromosomes X and Y Got Their Names, 1891 | The Scientist Magazine® - A little history. It all begins in the late 1800s. C. R. PERCIVAL’S MICROSCOPE SLIDE COLLECTION | Ingenium – Browse through some of the images made of slides created in the early/mid 1900s. Click on the larger image to get a magnifier that can be moved over the image. Food Trends 2019: Fermented Foods, Blueberries, Coconut Products, and More | Berkeley Wellness – How many of these are you already eating? What oil leaves behind in 2.5 billion gallons of water every day in US -- ScienceDaily – Wouldn’t it be nice to not have oil polluted water injected underground…and sometimes into aquafers? Water is already in short supply in some areas of the country (mostly in the west). We need technologies to never contaminate water in a way that it cannot be consumed by plants and animals…and ourselves. In Germany, Consumers Embrace a Shift to Home Batteries - Yale E360 – Half of the orders for rooftop solar panels are sold with a battery storage system too in Germany. I wonder when the US will catch up. Butterfly numbers down by two thirds: High-intensity agriculture reduces number of butterfly species in adjacent areas -- ScienceDaily – It’s not just butterfly numbers that are down either. Agriculture research needs to hone practices that are productive in the short term…and the long term. In other words – all agriculture needs to become sustainable for humanity and the rest of the organisms that inhabit the Earth. Nitrogen pollution's path to streams weaves through more forests (and faster) than suspected -- ScienceDaily – Nitrate is one of the abiotic tests we do for water quality assessment with high school students. This is a new finding to think about and incorporate in to the analysis of readings after heavy rains. The nitrogen might be moving so fast that the forest can’t absorb it! Missouri Making Hyperloop Plans - News | Planetizen – A hyperloop between Kansas City and St. Louis! What a boon to the two cities and probably easier to build since there is not the heavy population between the two cities like the route that was originally talked about in California. China Isn't Recycling Tons of U.S. Plastic Trash Anymore: Goats and Soda: NPR – We’re going to have to show some innovation in dealing with plastics – mostly single use – that we dutifully put in our recycle bins and assumed they would be recycled. Now a lot of them are going to landfills or polluting our waterways. With a little thought, my family has reduced some….but the next step is tough. Some products we need are only available packaged in plastic. March had increased activity from February – a nice ramp up to the busy months of the spring field trip season of April, May and June. It was easy to find little celebrations all during the month. A Creative Live course on bird photography – I always celebrate courses that hone what I already know…and show me something new that I want to try. Getting new glasses – I had skipped getting new glasses last year – thinking that my prescription had not changed enough. It’s worth celebrating to see better again. Snow on the ground but no on the streets – I celebrated a beautiful snowy day when the streets kept enough warmth to remain clear. It’s one of those instances where you can enjoy the scenery and not worry about hazardous driving conditions. Cleaning out stuff – We donated two carloads of stuff (a bicycle was a big part of one load. I celebrated making progress on cleaning out accumulated things that we no longer need. Miniature daffodils blooming in the front flower bed that bring back memories of my mother-in-law that bought and planted the bulbs in another garden 30 years ago. Tulip poplar and cherry buds brought inside and opening a few weeks before the buds outside open. 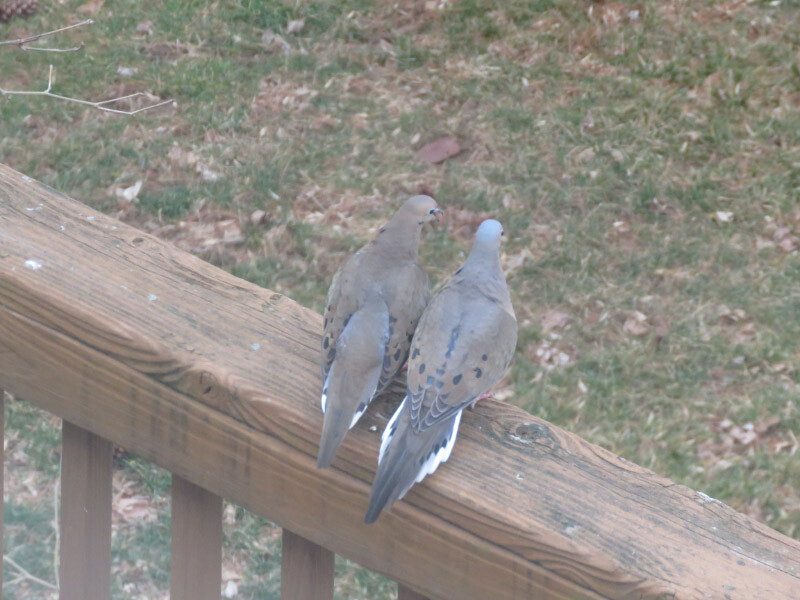 Doves mating on the deck railing. Frogs eggs in the little pool at Mt. Pleasant. A spring-like afternoon – full of sunlight and a warmer temperature. The biggest celebration of the month was the news that both my daughter and son-in-law have faculty positions beginning next fall in the same place! It’s quite an accomplishment for them to both get their PhD and then do a couple years as post docs…then this milestone. I was at Howard County Conservancy’s Mt. Pleasant on a sunny cold morning last week – and took a few pictures. There were two things that have always been there and almost always on my walk from parking to the nature center that I don’t think I have photographed before: 1) The old tractor that has been in the same place for so long that it is sinking into the soil under it (or silt is running down the slope to the wagon shed and accumulating around the tires). 2) The hook closure on the blacksmith’s shed….probably made by the blacksmith! The flowerpot people were dressed for spring…but looked a little bedraggled. The March winds have probably made some adjustments. I took a picture of a pine on the way to a stop in the Honors Garden. The pines are still the main greenery around. In the Honors Garden, the sun was highlighting last season’s cone flower seedpods. But the reason I was in the Honors Garden was to check out the little pond. As I walked up a frog swam rapidly through the water to a new hiding place. It was too cold for a lot more activity. This little pond is a favorite of the local Wood Frogs and they have been busy. 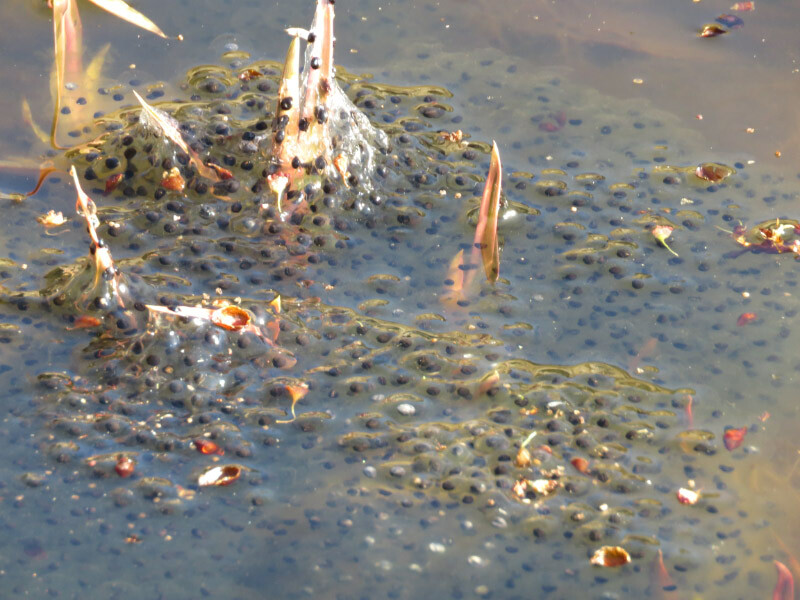 There were egg masses in the water….soon to be tadpoles if they are not too far out of the water and freeze before they can develop. I posted about the frogs here back in March 2016….but it was a warmer day and I noticed the frogs more than the eggs. I continued to the Nature Center for the training session scheduled for the day. 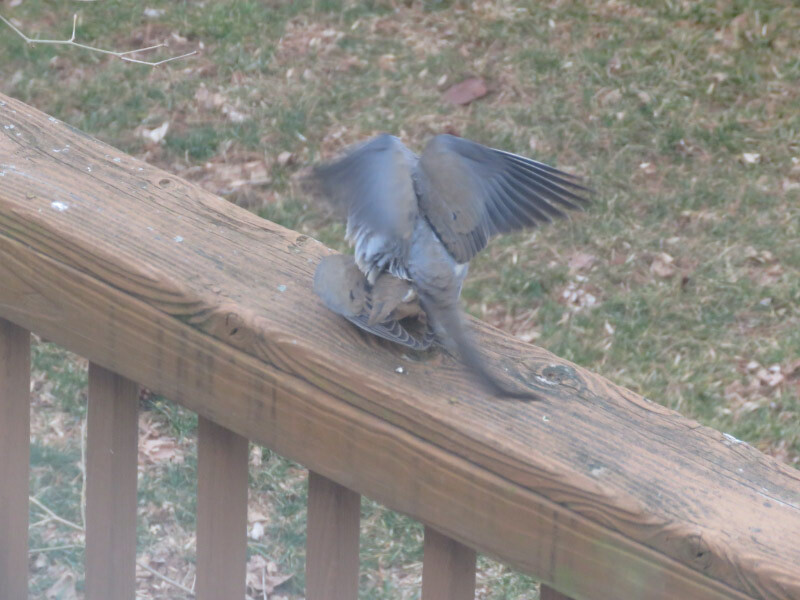 The birds seem to be moving faster this month – harder to photograph. There are a lot more robins about. 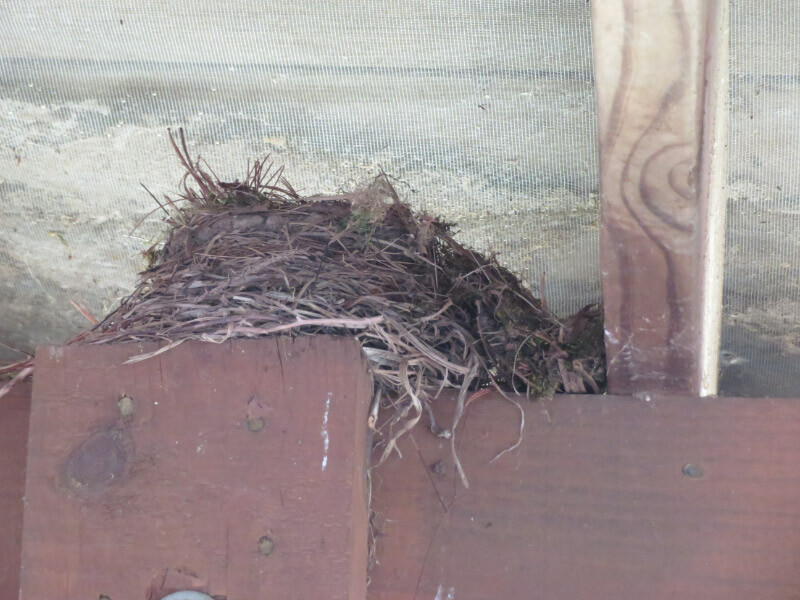 Some seem to be looking around for nesting places and others are just passing through. 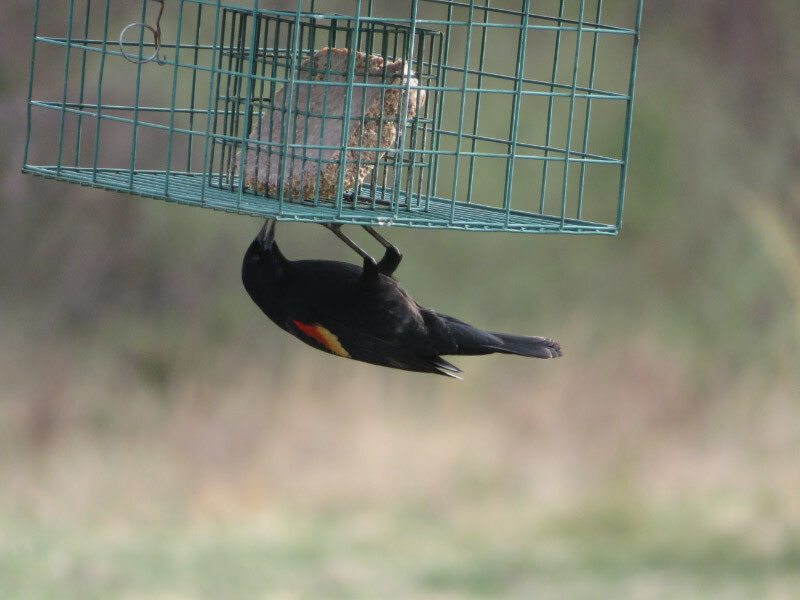 Flocks of red-winged blackbirds fly through this time of year too. 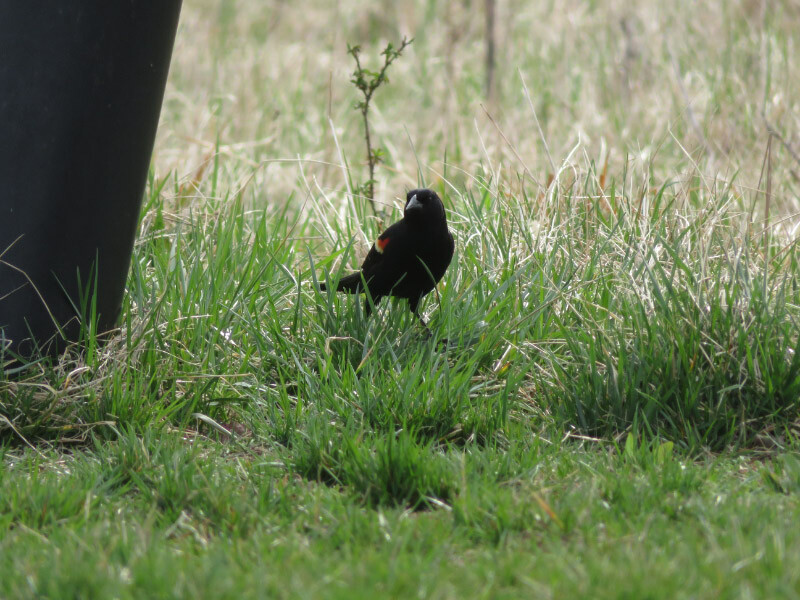 I took some pictures of a flock of birds high up in the tulip poplar trees behind our house one afternoon and discovered there were two types of birds in the group: red-winged blackbirds (black eyes) and rusty blackbirds with yellow rimmed eyes. The titmice were too fast for me this month – but I managed to get a picture of a Carolina chickadee. 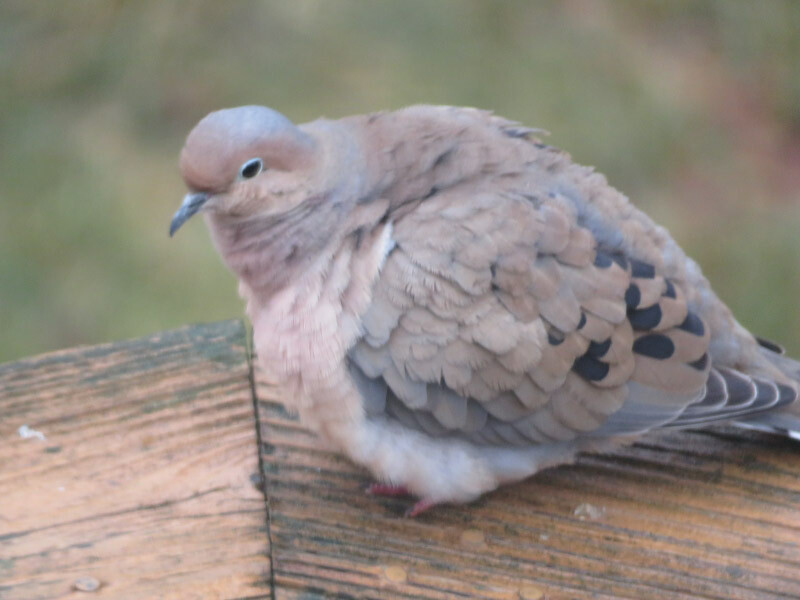 A mourning dove preened on the deck railing. 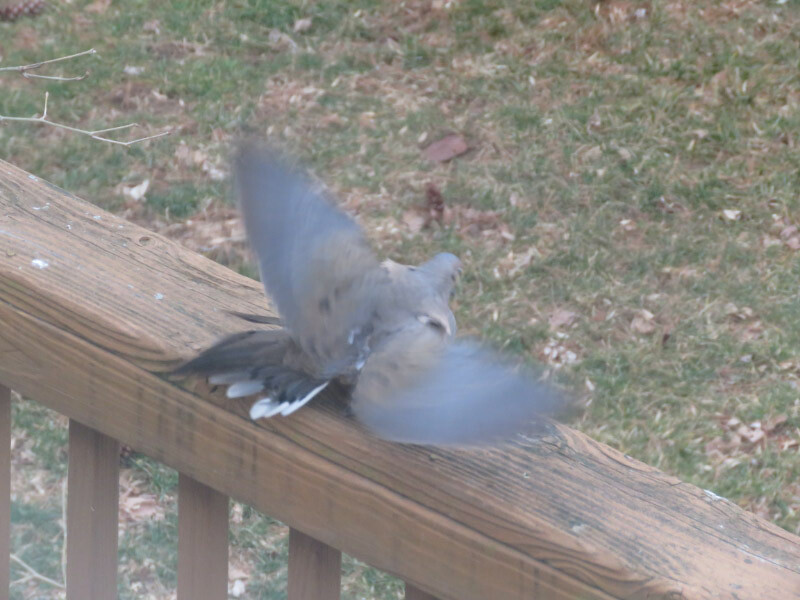 The most startling ‘birding through the window’ event of the month was a mourning dove that bashed itself against my office window. 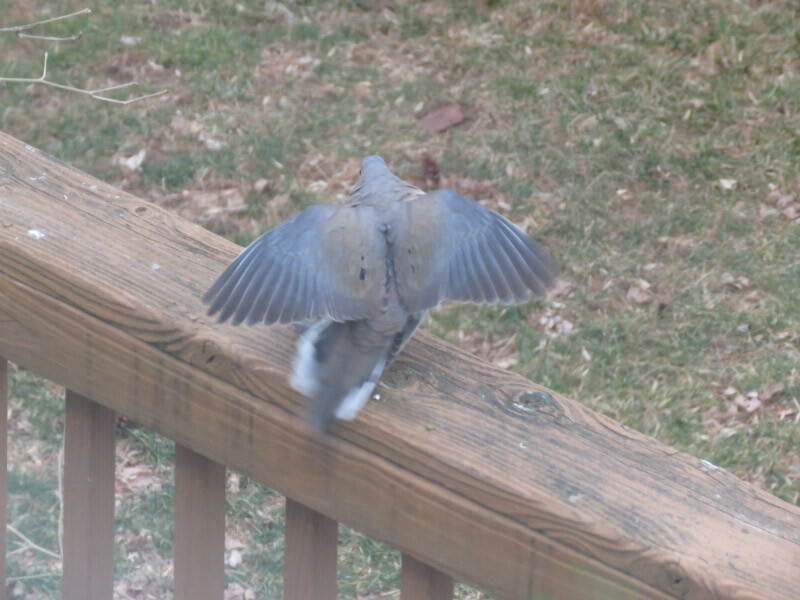 It left some small (about 1/4 inch) down feathers behind on the window. The bird apparently recovered quickly because it managed to fly to a neighbor’s roof – sat for a few minutes (recovering) – and then flew on as if nothing had happened. There was a similar incident a few years ago with a cardinal. I’m glad it doesn’t happen very often. Salt Could Play a Role in Allergies | The Scientist Magazine® - Atopic dermatitis has increased more than 2-fold since the 1970s….and researchers do not attribute the increase to greater awareness or diagnosis. Now comes the observation that people with lesioned skin from atopic dermatitis (but not psoriasis) had a 30-fold higher salt level in their lesions than in their unlesioned skin or skin from healthy controls. The connection to diet is speculative at this point…but we do have higher salt in our diet now that most people had in the 1970s. In Siberia, Toxic Black Snow Reveals the Toll of Coal Mining | Smart News | Smithsonian – Yuck! Pollutions from open-air coal pits…in the extreme. Another reason, I’m glad we’re moving away from coal powered electricity generation. I wondered if the people living in the area of black snow develop terrible lung problems. Piling Up: How China’s Ban on Importing Waste Has Stalled Global Recycling - Yale E360 – China’s plastic imports have plummeted by 99%, mixed paper has dropped by a 33%. Recycled aluminum and glass are less affected by the ban. So now we are sending plastics to landfills, incinerators or littering the environment. Communities across the US have curtailed or halted their recycling programs. That hasn’t happened (yet) where I live in Maryland. We must learn to produce less recycle (waste) and process it more locally…not ship is someplace else in the world. Meet the Bizarre American Bittern – Cool Green Science – It’s a type of heron that makes a strange sound (listen to the recording in this post). It is so well camouflaged that you are more likely to hear it than see it! Photography in The National Parks: Capturing the Grandness of The Grand Tetons – Reminds me that this is a National Park I want to see again. Last time we went, I wasn’t doing any photography yet. Top 25 Wild Bird Photographs of the Week: Interactions – National Geographic Society – Pictures that are more than just a bird. Prehistoric Microbes Inhabit an Oasis in the Northern Mexican Desert | The Scientist Magazine® - Fish, diatoms, and bacteria in lagoons in the Chihuahua Desert and cannot be found anywhere else on Earth. More than 5,000 species of bacteria and archaea have been documented. Owls against owls in a challenge for survival: Researchers forecast interactions between two owl species and the quality of their habitat in the Pacific Northwest -- ScienceDaily – I learned at the Festival of the Cranes (New Mexico) last fall about Barred Owls moving into Northern Spotted Owl (NSO) territory….and winning the competition. That further reduces the NSO populations which is already endangered because of over-logging of the old growth forests. 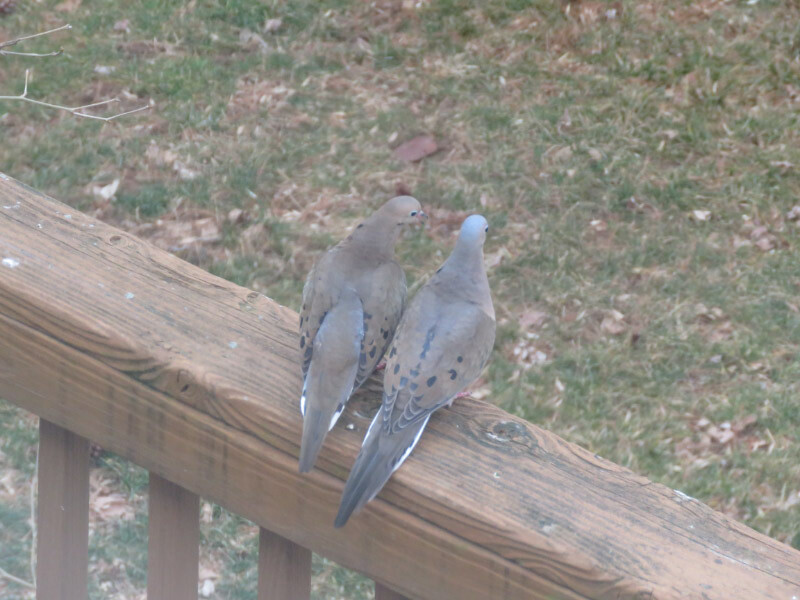 One morning last week – I looked out my kitchen window on a warm breezy march morning and noticed two mourning doves on the railing of our deck…just beginning the mating dance. 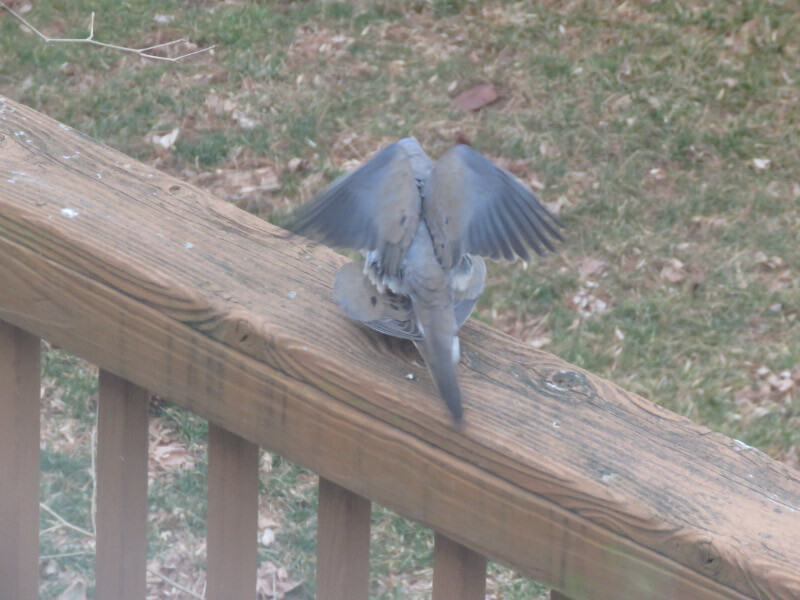 I ran upstairs to get my camera and started shooting the sequence below through my office window. The action takes place in just over a minute. The male has iridescent feathers on his head and neck. In the beginning, he is on the left….at the end he is on the right. Afterward the female flew off first and the male stayed put looking out over the yard. 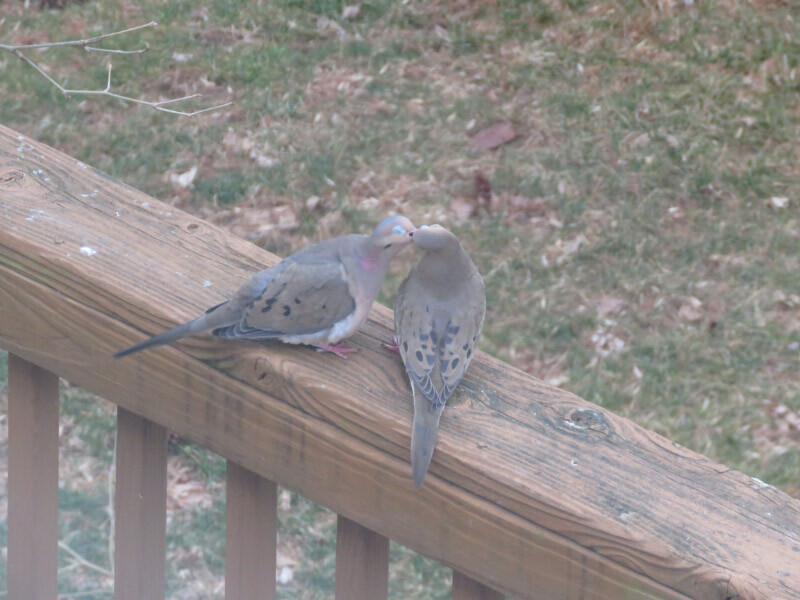 This is not the first time the deck railing has been a favorite place for doves mating. In May 2018 and April 2016, I managed to photograph a mating pair as well. 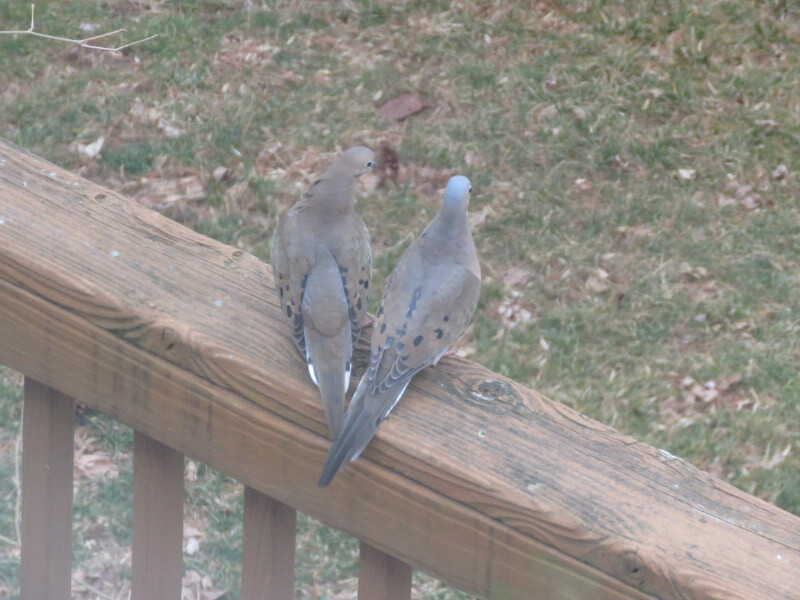 In our area, the doves are probably the most substantial and numerous prey for the red tailed hawks and other raptors. It was easier with my new camera and its continuous shooting feature. I also now recognize the early stages of the courtship so have a few more seconds to prepare. Wind Cave, In the National Park, Is 150 Miles Long...And Counting – About 2 miles are surveyed annually and there are about 3,000 unexplored openings that haven’t been checked. Climate of North American cities will shift hundreds of miles in one generation: New web application helps visualize climate changes in 540 North American cities -- ScienceDaily – The article includes a link to the interactive map. Baltimore Maryland will be like Cleveland, Mississippi in 60 years! Southern California Will Soon See Another Booming Superbloom | Smart News | Smithsonian – Much better than burn scars and mud slides. The Obelisks of Heliopolis - Archaeology Magazine – Obelisks taken from the city…a project to understand where they originally stood and the role they played. In Era of Drought, Phoenix Prepares for a Future Without Colorado River Water - Yale E360 – Living on the edge when it comes to water supply. It’s not just South Africa that has the challenge. BBC - Future - How Japan’s ancient trees could tell the future –Teasing out how much rain fell in Japan over the past two and half millennia by looking at the preserved wood of ancient forests. The soaring cost of US child care, in 5 charts and Paid family leave is an investment in public health, not a handout – Thought provoking…families coping in the modern world. Utilities are starting to invest in big batteries instead of building new power plants – Shifts in the way big utilities are structuring themselves for the future – it not all about new power plants. New molecules reverse memory loss linked to depression, aging -- ScienceDaily – Maybe in the future we’ll be able to treat some types of cognitive decline better than we can now. Top 25 Wild Bird Photographs of the Week: January and Top 25 Wild Bird Photographs of the Week: February and Top 25 Wild Bird Photographs of the Week: Feathers and Top 25 Wild Bird Photographs of the Week: Forest Birds – From National Geographic. There are multiples this week since I seemed to have a backlog in my gleanings holding area. Enjoy the colorful, graceful images. 'Upcycling' plastic bottles could give them a more useful second life -- ScienceDaily – Now that many countries that used to take our recycle waste have stopped accepting it, we are suddenly facing the problem of what to do with ‘recyclables’ closer to home. Making materials that have higher value is one way to keep more of it from ending up in landfills. Soundscapes of Arizona’s Aravaipa Canyon – Cool Green Science – Listen to some nature audio…if it’s too cold to get outside and into the wild right now! These would make great backdrops to a meditation practice. Photography in The National Parks: A Winter Shutdown Stay in Olympic National Park – I want to go! This is a national park I haven’t visited. What kind of bug is a bug? | The Prairie Ecologist – A little entomology lesson. Alaska in Flux: Slumping Coastlines – A comparison of a coastline between 1992 and 2018 …showing land slumping in to the Beaufort Sea. An airport is closer to the water now than in 1992.There is also a map showing that quite a bit of Alaska is wetter that is was in 1984. Lots of changes in the Alaska land. Work Underway to Return the Shine to Thomas Jefferson Memorial – The Jefferson Memorial is probably my favorite in DC. I’m glad it’s getting the renovation it needs to look good into the future. 14 keys to a healthy diet | Berkeley Wellness – A little update based on most recent recommendations (for example, dietary cholesterol is not something to worry about since it has little effect on most people’s blood cholesterol). Infographic: How Ginger Remodels the Microbiome | The Scientist Magazine® - I like ginger and am including it more consistently in my diet. It’s another food to boost gut health! As part of my early spring cleaning recently, I found a stink bug carcass in a storage closet. It could have been there for a long time. it looked a little squashed with the wings visible on one side). And it was missing some pieces – one antenna, 5 of the 6 legs, and an edge of the under abdomen. A few years ago, we had many more stink bugs inside our house than we’ve seen in the past year. The brown marmorated stink bug is invasive in the US and initially seemed destined to be a bother for the long term but maybe the other bugs (wheel bugs?) and spiders and parasitic wasps that are native have figured out that stink bugs are fit to eat! Or maybe it is just the vagaries of the weather than have caused the population of stink bugs to drop off. I experimented with the higher resolution clip on lens with my phone. The bug was not flat enough to get the whole field in focus. 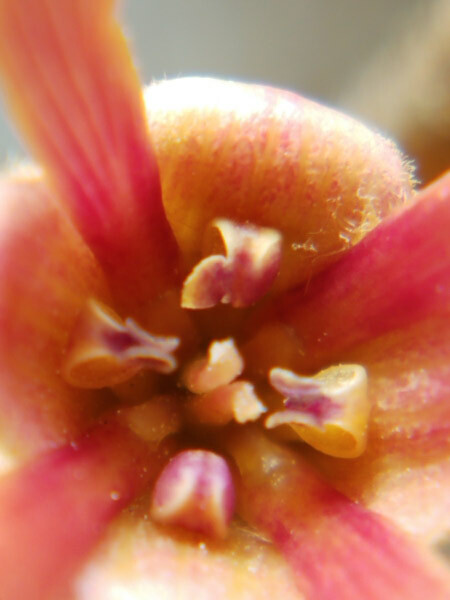 I was a little surprised by the extra color and texture that showed up with the magnification. I took the carcass to the trash (outside). I’ll wait for a better specimen to do a more thorough photographic study. Last week, a kindergarten class was the first field trip of the ‘spring’ at Howard County Conservancy’s Mt. Pleasant Farm. The temperature was in the 30s and there was a little breeze – very wintery feeling. The children and I had our coats zipped, hoods up, and gloves on. 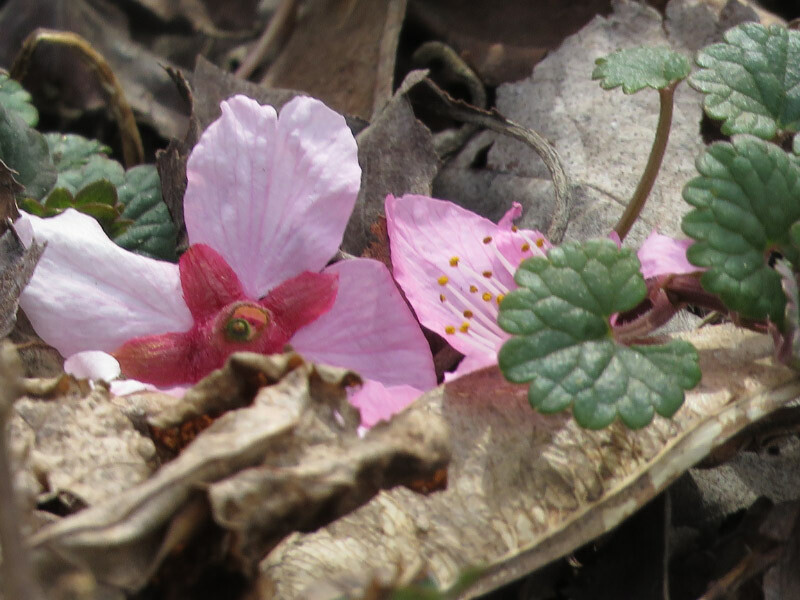 We hiked and looked for signs of spring….and remnants of other seasons. We saw daffodils coming up and snow drops blooming…signs of spring. We looked at holly with its shiny green leaves and red berries which is often symbolic of winter. One holly was leaning over the snow drop bed. 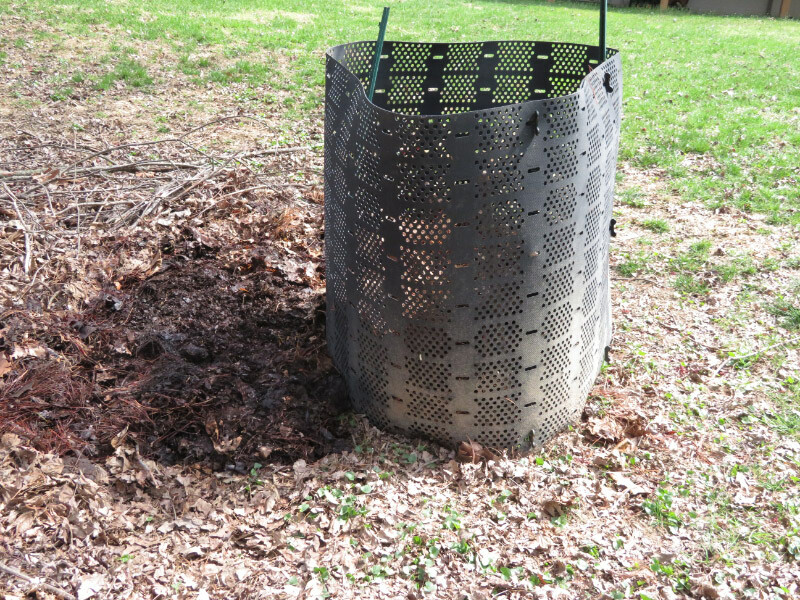 We saw evidence of squirrels around: lots of opened black walnut shells which had been their food all during the winter. We searched the trees for squirrel nests but decided that the strong winds recently must have blown the nests away. There were some trees that had been cut down recently. We noted that the centers had been rotting which was probably why they had been cut. The largest stump was near the farm house and the children crowded onto it for their teacher to take a field trip picture! The children were surprised to see the witch hazel in bloom and learning that it normally blooms in late winter. They saw the brown leaves on the ground and still clinging to the branches of the tree – correctly identifying them as the leaves from last summer/fall. There was a winter jasmine with buds of all sizes – and a single flower. It was another sign of spring on the way. They were surprised at the different sizes of buds and identified the ones that were about ready to open. In the old orchard, we looked at the buds on the apple trees and the pear tree – deciding that the pear tree would probably bloom first based on way the buds looked. By the end of the hike – they were ready for a little warm up in the nature center then back outdoors for a focused lesson starting with looking for animal tracks in the muddy areas. It was a good start to the ramp up of spring field trips! Every winter, I hike the trail to a wet area at Howard County Conservancy’s Mt. 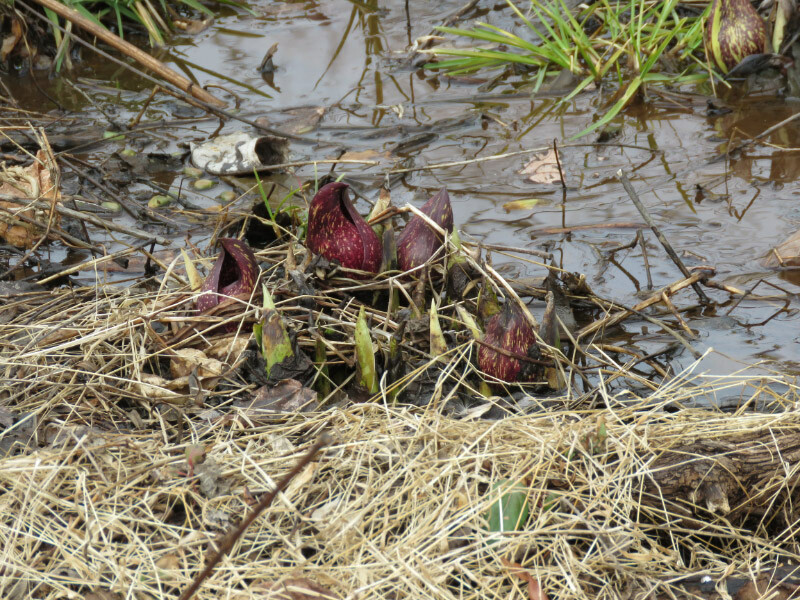 Pleasant Farm to see the Skunk Cabbage coming up. 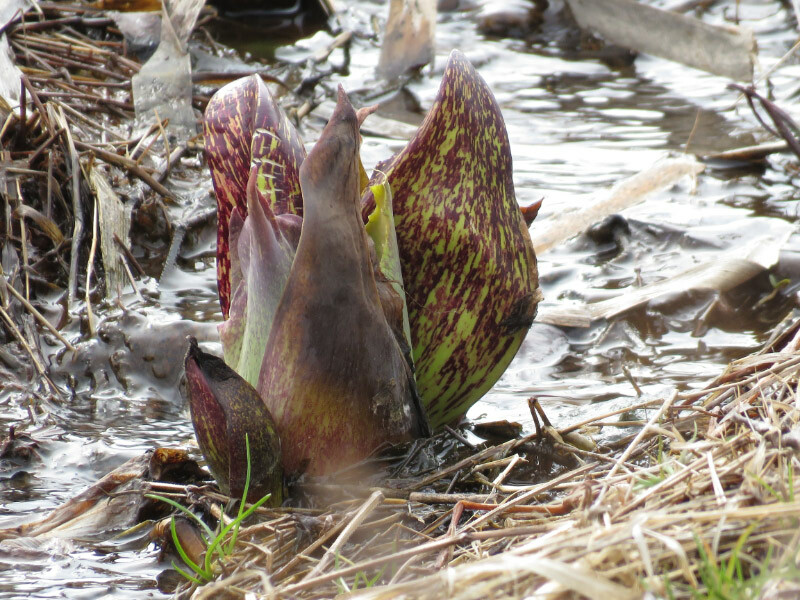 I was a little later than usual this year, but it’s been a cold February and the skunk cabbage was still blooming last week. I found all stages of its early development after slogging through the muddy trail to get to the location. Some of the plants appear damaged (outer part black or brown) but the center might still be alive and able to continue development. Most were near or in water; it’s been a very wet winter and these plants like to be wet. They come back year after year from a rhizome; this stand appears to be about the same size as previous years which caused me to wonder if the plants are producing any viable seeds. 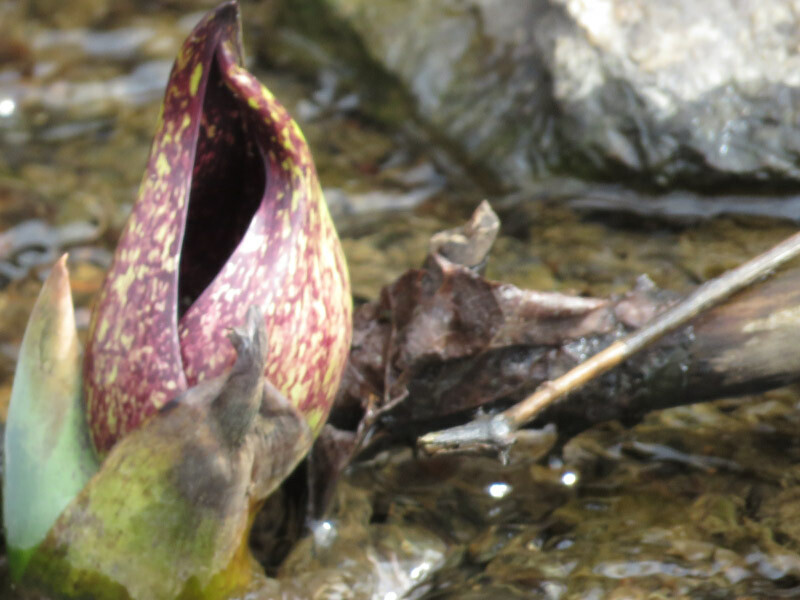 The best picture of the morning was a bloom (like a golf ball (spadix) inside a purplish hood (spathe)). 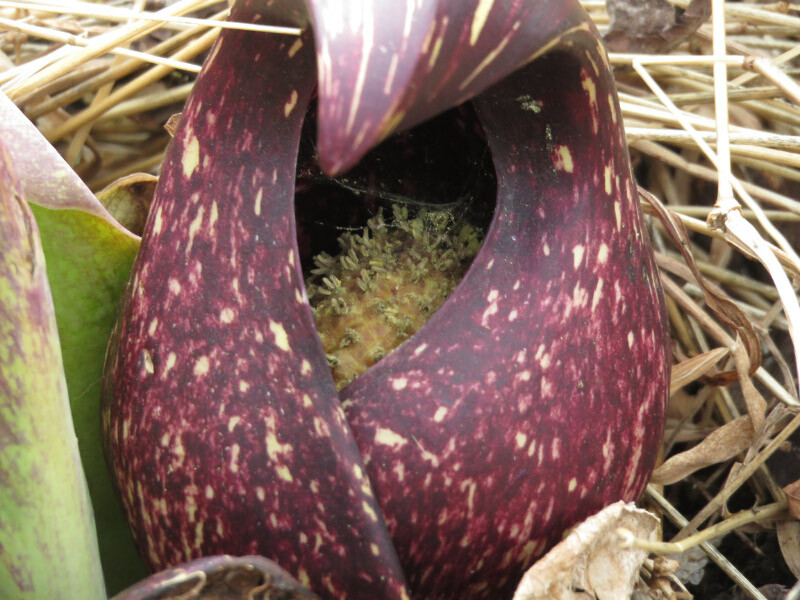 I’d read that the inside of the spathe is warmer than the surrounding air and may be attractive to insects/spiders. Sure enough – there appears to be a spider web inside this spathe!